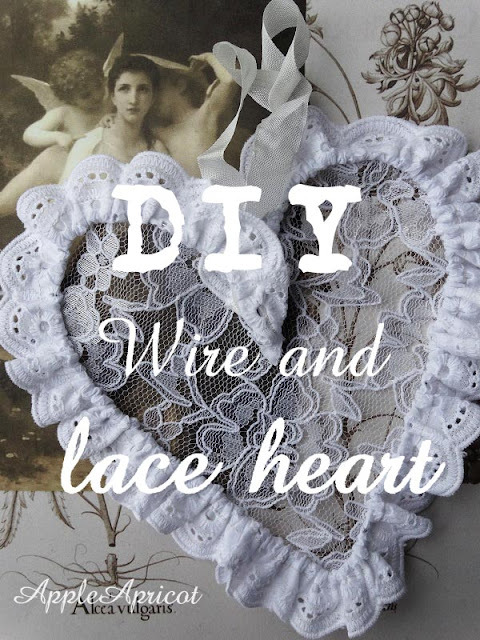 A few days ago I saw a beautiful tutorial of a wire and lace heart by Miri of Miris Rosenhuegel (scroll down on her blog page for the heart tutorial). I loved the wire and lace hearts she created but the tutorial is in German (which doesn't have to be a problem though) and I wanted an easier way to create a similar effect plus I wanted to add lace in the middle too. So I decided to make my own DIY. 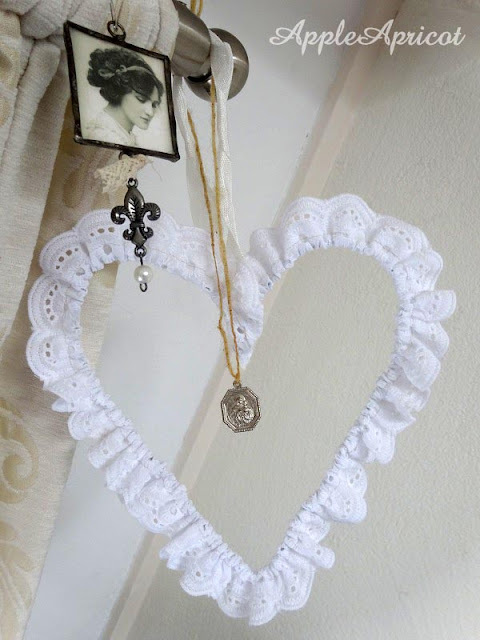 So here it is, my wire and lace heart DIY. For the description, scroll down please. by folding it in the length. Put pins in to secure. 3. Sew the broderie anglaise as seen above, making your tunnel. 4. On one of the ends of the wire make a little loop with the pliers. This loop will help the broderie to stay in place. 5. Push the wire gently through the tunnel. and make another loop with the second end to attach both ends. and push the end loops of the wire into the ends of the fabric. Just a little, enough to hide them. gather the broderie and stitch it so that it will form a point. Just gather and stitch as you please. It will also secure both ends even further. 9. Attach a ribbon to the top center of the heart. And sew by hand some lace fabric on the back. Cut off the excess lace fabric when done. Of course you could leave out the lace in the middle of the heart. And I have been thinking, it would be nice to add an embellishment or charm or whatever. You could use the curls you made to attache something like that. Such a pretty project Wendy! Sjonge, wat een romantisch hartje. Heel mooi, en super duidelijke uitleg, dank je wel. AMAZING!!!!!!!!!!!!!!! I cannot believe you shared such wonderful instructions on how to make a heart! 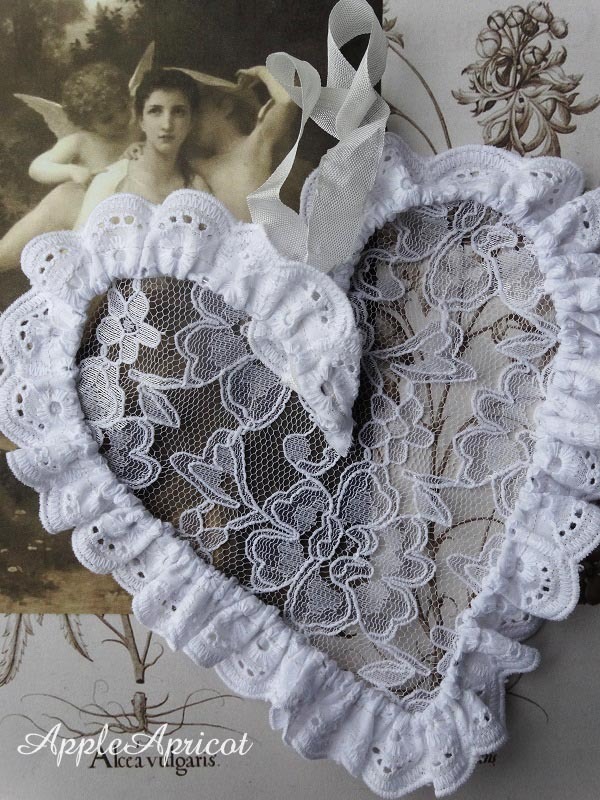 I am bookmarking this and maybe with the lace my friend just got me I can attempt it. This project will be great to make my hand try it too! ja mooi, jammer dat ik niet zo'n ster ben op de naaimachine. Volgens mij vind ik dat toch wel de mooiste vintagefoto die je gebruikt hebt bij de onderste foto. Deze vrouw blijft me intrigeren. This is such a pretty heart and a great tutorial too....thank you! Dear Wen, you are so sweet to show the creation of your lovely heart, It is beautiful, and so lovely created with the lace in the middle !! 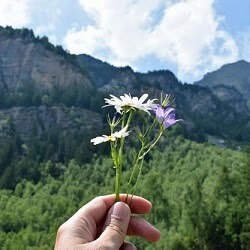 I love your photoes, and the wonderful flowers from your garden, too. 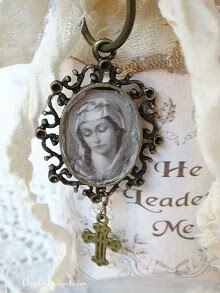 I like this idea - and, being me, I am envisioning crazy quilting instead of lace in the center!! So very beautiful ... I bet your home will be filled with these! Oh my that is just Beautiful, I love it both ways! Thanks so much for sharing! What a kind gesture Wen! Thanks so much; this is wonderful. Excellent diy project. It's so beautiful!